Anyone who is familiar with Asus' products will be familiar with the Transformer concept. The new Asus Transfomer Pad is here to challenge the dominance of the iPad Air, as well as the Sony Xperia Tablet Z and Google Nexus 10. The key to the popularity of the Asus Transformer Pad series has been the keyboard docking station, and that's present here too - allowing it to double up as a mini-netbook. Microsoft has taken massive strides in this area with the Surface 2 coming with an extra keyboard case, so Asus really needs to up its game if it wants to keep up with the big boys. Taking a look at the new Transformer Pad you'd struggle to see anything different between it and its brethren. At 263 x 180.8 x 8.9mm it is only 0.4mm deeper than the Transformer Pad Infinity. It is 13g lighter, however, weighing in at only 585g. Adding the keyboard dock takes the Transformer Pad to 1155g, although it doesn't feel significantly heavy when popped into a bag. Asus' device is significantly larger than the iPad, although the Transformer Pad comes with a 10.1-inch screen, making it 0.4 inches bigger. A 2560 x 1600 WXVGA screen is higher resolution than both the Transformer Pad Infinity and the iPad Air, even dwarfing the Retina Display's 264ppi at 299ppi. Behind that screen sits a 1.9GHz quad-core NVIDIA Tegra 4 processor (the Tegra 3 is in the Infinity) backed up with 2GB of RAM, as well as 32 or 64GB of internal storage. Asus also offers 5GB of cloud storage for life. Asus has also equipped the Transformer Pad with the same impressive battery that has come with all Transformer Pads. The 31Wh power pack in the tablet provides up to 13 hours of use, with the 16Wh dock providing a further four hours. Other key specs include the 5MP rear camera so you can show everyone that you're photographing something, 1.2MP front sensor, microSD support up to 128GB and a micro HDMI port. The keyboard dock also provides further support with a USB 3.0 port and a full sized SD card slot. To make use of all that hardware, the Asus Transformer Pad comes with Android 4.2 Jelly Bean, although Asus has pushed out an update to Android 4.3. Looking at the undocked tablet, there is nothing that particularly stands out. The thick black bezel and large screen are reminiscent of almost every tablet I've seen. The front camera sits at the top of landscape mode, making it easier to make video calls when docked. On the back of the aluminium chassis is the power/lock button and the volume rocker, as well as the 5MP camera, while a microSD slot, 3.5mm headphone jack and micro HDMI port sit on the left hand side, leaving the right completely bare. The base holds the charger port, as well as slots for the keyboard dock to lock into. 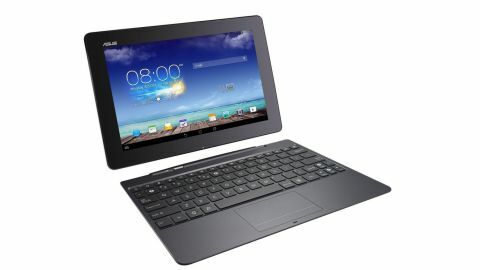 When the Asus Transformer Pad is docked, the tablet becomes an Android netbook. The SD slot and USB 3.0 port sit on the right, leaving the dock charging port on the left. Asus has created a really good dock, and although it feels small it doesn't feel cramped. The dock also comes with a trackpad, meaning you don't have to keep tapping the screen. Every button that you could hope for is there, including buttons to control various connectivity options, brightness, media controls and a screenshot key. Android's home button occupies the space where the Windows/Command button is usually found. Overall, Asus has taken what has kept the Transformer Pad series so good, and improved it. The screen is bright and the resolution leaves nothing wanting.